-Manufactured from borosilicate glass 3.3 which isresistant to heat and almost all chemicals. 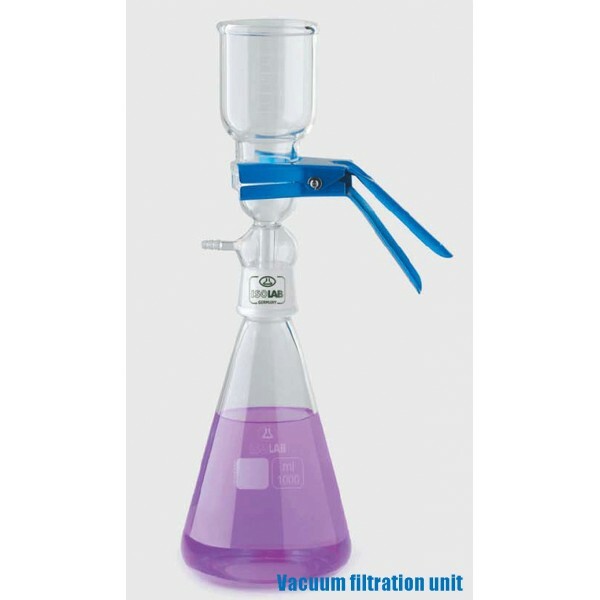 -Particularly suitable for analysis of microscopic residue,particle control, filtration of alkaline and agressive solutionsas well as buffer solutions for HPLC. -Borosilicate 3.3 glass sintered disc is used to supportmembranes.Suitable to be used with 47/50 mm diameter membranes. -Autoclavable at 121°C and 1.1 bar for 30 minutes. Vacuum connection and metal clip.